Definition at line 60 of file UnresolvedSet.h. Definition at line 80 of file UnresolvedSet.h. Definition at line 79 of file UnresolvedSet.h. Definition at line 88 of file UnresolvedSet.h. Referenced by clang::LookupResult::addDecl(), buildDeclareReductionRef(), clang::ASTImporter::Import_New(), clang::ASTNodeImporter::ImportTemplateInformation(), notePlausibleOverloads(), clang::Sema::PerformContextualImplicitConversion(), clang::TreeTransform< Derived >::RebuildCXXOperatorCallExpr(), clang::Sema::tryExprAsCall(), clang::ASTDeclReader::VisitFunctionDecl(), clang::ASTNodeImporter::VisitUnresolvedLookupExpr(), and clang::ASTNodeImporter::VisitUnresolvedMemberExpr(). Definition at line 92 of file UnresolvedSet.h. Definition at line 126 of file UnresolvedSet.h. Referenced by clang::LookupResult::addAllDecls(), buildDeclareReductionRef(), buildOperatorCoawaitCall(), buildUserDefinedMapperRef(), and clang::TreeTransform< Derived >::RebuildCXXOperatorCallExpr(). Definition at line 82 of file UnresolvedSet.h. Referenced by clang::LookupResult::addAllDecls(), clang::Sema::AddFunctionCandidates(), begin(), clang::LookupResult::begin(), buildDeclareReductionRef(), buildUserDefinedMapperRef(), clang::ASTImporter::Import_New(), IsOverloaded(), noteOverloads(), notePlausibleOverloads(), clang::ASTNodeImporter::VisitUnresolvedLookupExpr(), and clang::ASTNodeImporter::VisitUnresolvedMemberExpr(). Definition at line 85 of file UnresolvedSet.h. Definition at line 120 of file UnresolvedSet.h. Referenced by clang::LookupResult::clear(), and clang::Sema::tryExprAsCall(). Definition at line 123 of file UnresolvedSet.h. 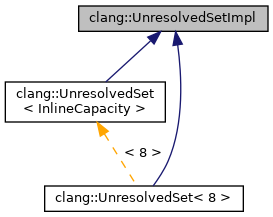 Referenced by clang::LookupResult::empty(), clang::LookupResult::getRepresentativeDecl(), clang::LookupResult::resolveKindAfterFilter(), and clang::LookupResult::setNotFoundInCurrentInstantiation(). Definition at line 83 of file UnresolvedSet.h. Referenced by clang::LookupResult::addAllDecls(), clang::Sema::AddFunctionCandidates(), buildDeclareReductionRef(), buildUserDefinedMapperRef(), end(), clang::LookupResult::end(), clang::ASTImporter::Import_New(), noteOverloads(), notePlausibleOverloads(), clang::ASTNodeImporter::VisitUnresolvedLookupExpr(), and clang::ASTNodeImporter::VisitUnresolvedMemberExpr(). Definition at line 86 of file UnresolvedSet.h. Definition at line 114 of file UnresolvedSet.h. Definition at line 116 of file UnresolvedSet.h. Definition at line 128 of file UnresolvedSet.h. Definition at line 129 of file UnresolvedSet.h. Definition at line 99 of file UnresolvedSet.h. Replaces the declaration at the given iterator with the new one, preserving the original access bits. Definition at line 108 of file UnresolvedSet.h. Definition at line 110 of file UnresolvedSet.h. Definition at line 121 of file UnresolvedSet.h. Definition at line 118 of file UnresolvedSet.h. Definition at line 124 of file UnresolvedSet.h. Referenced by collectViableConversionCandidates(), diagnoseAmbiguousConversion(), diagnoseNoViableConversion(), IsOverloaded(), and clang::Sema::PerformContextualImplicitConversion(). Definition at line 66 of file UnresolvedSet.h.